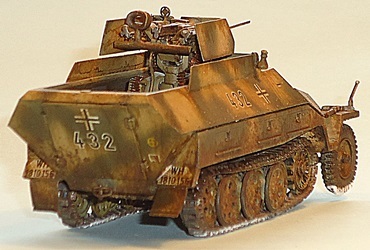 According to Panzer Tracts  the Sd.Kfz.251/21 was produced from October 1944 to March 1945. According to  production started before August 1944; according to  it was in September. The prototype (seemingly called Sd.Kfz.251/14 at the time ) was converted from an Ausf.C. It had a three-sided shield for the guns, a four-sided shield added to the superstructure and three foldable seats instead of the usual benches and a seat for the gunner. It had one large and two small ammunition bins. 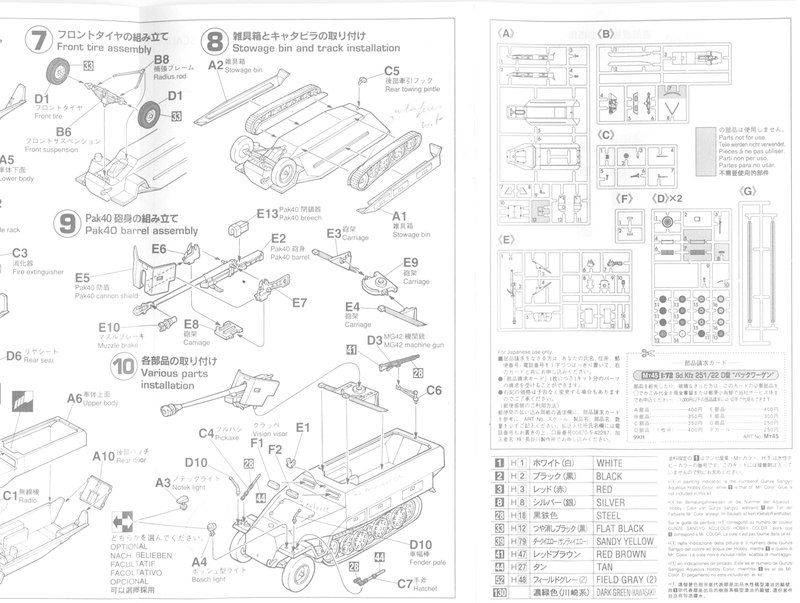 Production variants were planned to have the 15mm MG151 at first (+/- the first 50 vehicles) and the 20mm MG151 later (the gun came in two versions). The armor around the guns was completely redesigned and the additional armor for the hull was limited to three panels at first and completely eliminated at the end. 1. Three sided armor added to the hull. Circular brace over the gun mount. 2. 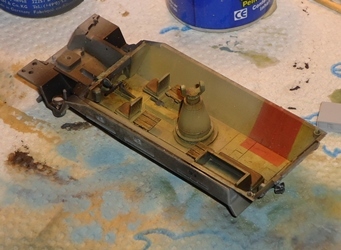 Three sided armor added to the hull. Circular brace under the gun mount. Redesigned gun assembly and armored shield. It seems that field modifications existed as well, some with different armor configurations for the gun, with at least one documented vehicle based on an Ausf. 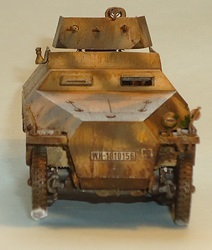 C.
My starting point was the Hasegawa Sd.Kfz.251/22 Pakwagen for two reason: because I had one and because I wanted to use the gun on an Sd.Kfz.234/4. This means that I basically used the kit as if it were just another Sd.Kfz.251/1. 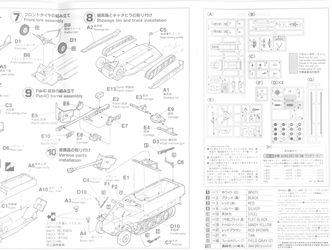 Most of the comments in this review will thus apply to any Hasegawa Sd.Kfz.251. The roadwheel design predates the single-part-row trend that we are used to now thanks to Dragon, Revell and MPK. Still, this has an advantage as the roadwheels will not all have the exact same clockwise orientation which enhances realism. 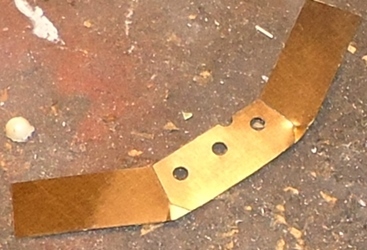 A positioning tab is provided to make sure both halves line up. The torsion bars have the correct staggering between left and right side. The drive sprocket is a bit too close to the fenders for comfort. I replaced the black rubber band tracks with rubber-like parts from MPK. I don't know what they are made off, but they resemble Dragon Styrene, albeit in a grey color. The sample I got from MPK was labeled as 7308, but I can't find it on their site, so I don't know if it is currently available. While they are a pleasure to work with, they are narrower than the Hasegawa tracks. The result is that the outermost roadwheels will no longer touch the edge of the tracks, which doesn't look quite right. 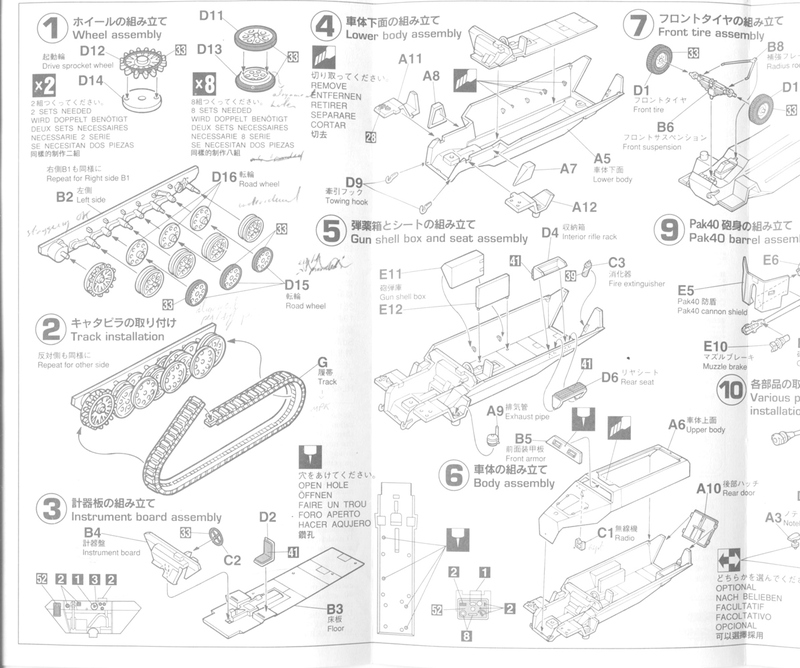 The interior was modified to accept the CMK kit as explained below. A box (for ammo ?) was added to the right rear corner, originating from the spare's box. More about that later. The kit offers the option between a Notek and a Bosch headlight. For the /21 a Bosch headlight would be the most appropriate. The (co-)driver's visor was enhanced by deepening the vision slit. The same can be said for the lateral vision slot and the panel line between driver's and fighting compartment. The pick-axe on the right fender is strangely rendered. With the outer (pointy) ends molded on the fenders, and the rest as a separate part. A mirror was made with the punch and die set and added to the left width indicator. 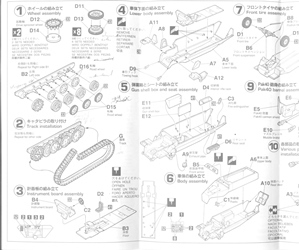 Measured against the plans in , the Hasegawa kit scales out to approximately 1/69 in width and length. The main culprit being the fighting compartment, which is around 8% too long, the engine deck actually being 1% too short. If you look attentively, this is something that you will notice, although it is not that obvious at first sight, because most angles look right. In my humble opinion, I feel that CMK botched the job and offers a mix between the prototype and a mid production /21. It has parallel sides. The production versions were both markedly tapered. The protoype shield had no angled bottom and neither does the CMK part; the production shield has. The cut-out in the top of the gun shield corresponds to the prototype; the production vehicles had a hole. There is no arched support bar over the guns. I only modified the lower corners by milling them off and adding scraps of plasticard. In hindsight, I should have either left the kit parts as such, pretending there was a very very early vehicle based on the Ausf.D that kept the configuration of the prototype, or gone the whole hog and made the shield from scratch. The resin bar at the rear of the guns is not seen in drawings in  and the attachment of the gun to the pedestal doesn't capture the look of the real thing. A seat for the gunner (attached to the gun mount) is missing. I added it from metal wire and plasticard. Note that the gunner's seat was hinged so that it always hung down vertically when the gun was raised or lowered. The casting of the gun assembly is also far from perfect with noticable warping. The gun barrels would best be replaced by metal tubing. (They are too short, far too thick and lack a muzzle.) Note that the outer 15mm guns had a beveled muzzle; the 20mm guns didn't. I have the feeling that my replacement gun barrels, made from brass rods, while longer than the kit parts, are still 1mm too short. There is still a lot of discussion going on about the interior of this vehicle (e.g. here). At first, I thought CMK's interior was totally wrong, but I am no longer so sure and I believe it is only mostly wrong. The vehicle had a crew of four. Panzer Tracts  shows three foldable seats in the fighting compartment and the rear benches of the Sd.Kfz.251/1 replaced with ammunition bins. As I assume that the driver's and co-driver's seat were still installed, this makes seating for five. CMK doesn't mention the collapsable seats, and keeps the left rear bench, which makes seating for four. Plausible, but ammuntion bins would still be needed to take the place of the right rear bin. Thus equiped, the vehicle would allow seating for seven. I clearly should have done more research before I started, but luckily I already mentioned that I went for a field modified vehicle, right ? I am not sure that the repositioned radio set (according to the CMK instructions) is correct, but it might be. I didn't use the PE face for the radio, as I felt the kit part was sufficiently good. For the same reason, I didn't replace the rear doors. Speaking about the radio, the radio mount should be on the added hull armor (front right). The middle of the three ammo boxes, attached to the pedestal, should be far bigger than the two on the sides. CMK gives three identical boxes. Looking at the drawings in  The middle one should be a bit wider and not as high, while the other ones should be a bit lower and a lot narrower. In fact, when installing them, they interfere, and even more so if you add jumpseats, like I did. Note that I believe, based on the few pictures available, that the ammo bins didn't rotate with the gun. I don't know how that worked out in practice, as it would limit the traverse of the gun. If you want the guns to represent an operational configuration, you should add some ammo belts between the bins and the guns. Mine came from a prehistoric PE set. The extra armor for the top of the hull doesn't quite match the design. The front plate is slightly arched on top (which I don't see in plans or pictures) and the folded sides, being parallel to the center section, will angle downward once you put the shield in place in a slightly reclined position. To remedy this, I sanded off the lower corners of the folded flaps. Unfortunately, by doing so, I bent the shield. Some of the disadvantages of PE is that, once bent, it is difficult to get it straight again. The fit with the side panels was also sub-optimal, but that might be a lack of skills on my part. The rear angle was also not steep enough compared to . After installing the PE parts and feeling positively unhappy, I removed them and made the shields from plasticard. This is actually far easier and faster than messing with the PE parts. The instructions don't mention to leave off the splash guard for the front MG. According to  it should be left off for the earlier versions with the additional armor, which makes sense. If you agree with this thesis, you should fill in the hole for the MG. The same argument can be made for the rear MG and its mounting hole. 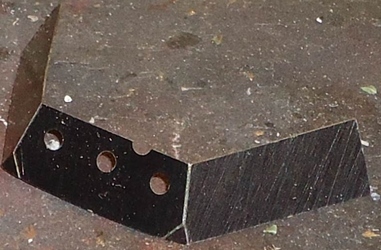 A drawing in  shows a small circular cover plate at the rear, which I made with the punch-and-die set. There are four PE padlocks, but the Sd.Kfz.251 had six bins on which to use them. It seems the real vehicle had a travel lock for the guns, which I didn't replicate because I didn't find any details about it, apart from people mentioning there were two types. The rear fender flaps are nice additions. Note that late-war vehicles were often seen without. The small hooks for the nose are also nice, but my carpet monster ate them both for breakfast. Apart from the PE parts from CMK, I added a rear convoy light that was left over from an Eduard set for the Schwimmwagen and added a small rod from stretched sprue to the pin in the trailer hitch, to make it into an L-shape. 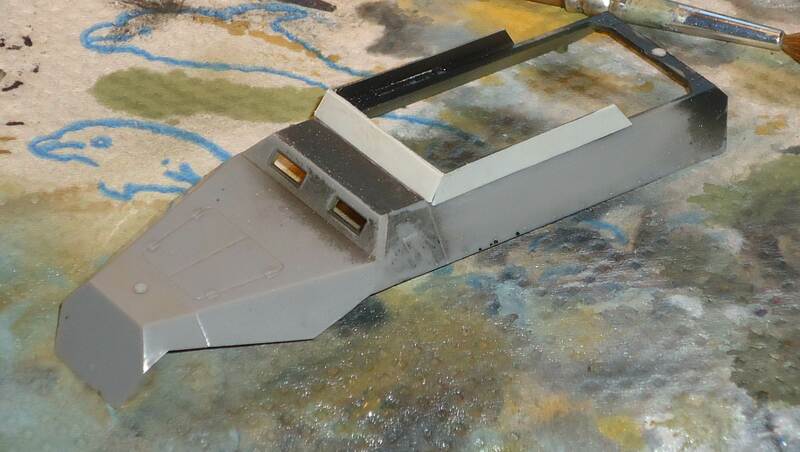 An antenna mount was found in the spare's box and added to the hull armor. A horseshoe was glued to the front fender as a token of good luck (which I will need if I want to convince someone that this kit looks like the real thing). It came from a Tracks & Troops set. Some items from the spare's box were added to the bin in the crew compartment. I chose to depict my vehicle as one of 13 Pz.Div. as it might have appeared in the Autumn of 1944 on the border of Southern Ukraine/Hungary. Most of the Division would be destroyed in Budapest in December 1944, but a substantial number of the Schützenpanzerwagen escaped to form the core of II.(SPW)/Pz.Rgt. FHH2. 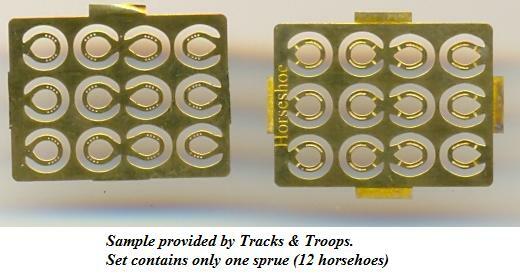 They were used in the Armored reconnaissance Bn and the Panzer Grenadier Bn. I chose to depict my vehicle as belonging to the Panzergrenadiere. Note that at this point in the war Panzergrenadiere used Grass Green Waffenfarbe and could wear the Feldgrau Panzer tunic, while the recce troops would be using a black or reed green Panzer tunic with yellow Waffenfarbe. Decals for the 13 Pz.Div. came from ICM set D72001. (I believe this set is now out of production.) The remaining decals are from the original Hasegawa kit. The latter a on the thick side. The antenna had broken off just before taking these pictures and I chose not to replace it before the vehicle had found its place in a diorama. The same argument holds for the pin in the towing pintle. The flap for the rear convoy light is missing. This is a sad story. It detached during final construction. I gently put the small piece down on my workbench to glue it back on, only to realize three weeks later that I had completely forgotten about that. (My current span of attention can be counted in Planck time units.) Some scratchbuilding is in order, as the carpet monster cannot be left unattended for three weeks, so much is clear. A final flat coat and some diorama specific weathering still needs to be applied. Some plaster from the diorama has already attached itself to the tyres and tracks.